"Now I can’t lie about not having gum,” one student scoffs on Twitter. They were intended to keep students safe. But on Monday, as teens at Marjory Stoneman Douglas High School in Parkland, Florida, returned from spring break, they took to Twitter to mock the clear backpacks now required by their school district, describing them as a violation of privacy, a meaningless gesture and a distraction from real gun reform. “My new backpack is almost as transparent as the NRA's agenda,” wrote Lauren Hogg, a freshman at the school and a survivor of the Feb. 14 mass shooting that killed 17 students and faculty members. 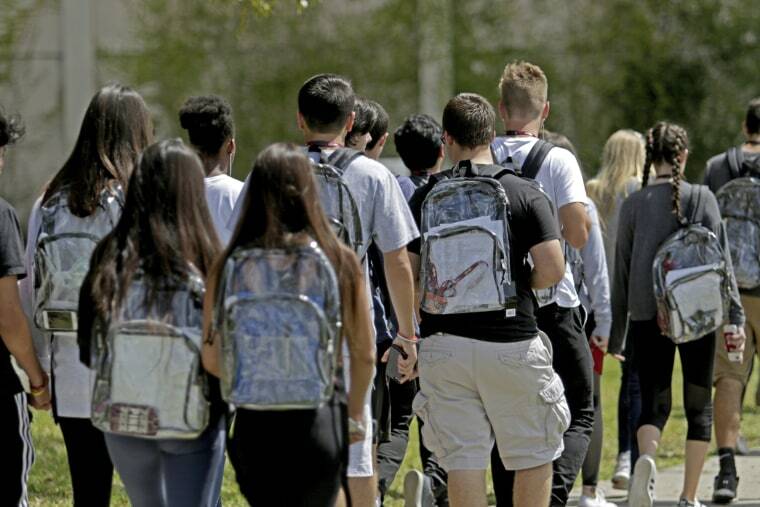 The backpacks, which were provided to students at no charge, are among the new security measures introduced by the Broward County school district in the shooting's aftermath. As students lined up between metal barricades to get those backpacks checked before heading through school doors, some said they felt overwhelmed by the new safety policies. “We’re just trying to learn,” said Edenbaum. In a letter to students’ families last month,Robert Runcie, superindent of Broward County schools, said the district was considering installing metal detectors and using wands. Florida Highway Patrol officers will provide security at the high school, but each school in the district will have its own school resource officer by the start of the 2018-19 school year. New identification badges to be worn at all times, a greater police presence, continuously locked classroom doors: the list of safety initiatives from Runcie goes on and on. The new measures, Runcie said, are meant to help “fortify” the school and expand safety protocols. But many students were having none of it. “Starting off the last quarter of senior year right, with a good ol' violation of privacy!” one student, Delaney Tarr, said on Twitter. “Now I can’t lie about not having gum,” scoffed another. Some students used the see-through material of the backpacks to display protest signs and messages. "This bag contains everything politicians care about besides money," read Lex Michael's sign in the pocket of an empty clear backpack. Another student, Sarah Chadwick, snapped a photo of the new backpacks with price tags attached and tweeted directly at Florida Sen. Marco Rubio — a nod to what she has previously characterized as students’ “worth” to the senator, who she calculated has received $3.3 million from the National Rifle Association, or $1.05 for each of Florida's estimated 3.1 million students. “Is that all we’re worth to these politicians?” Chadwick asked during a rally last month. Rubio has said that while he supports the students’ right to protest for what he described as "a gun ban," he doesn’t agree with all their proposals.